I was so excited to find this restaurant as it is linked to the great Alain Ducasse, of course of three Michelin starred Alain Ducasse at the Dorchester amongst others. 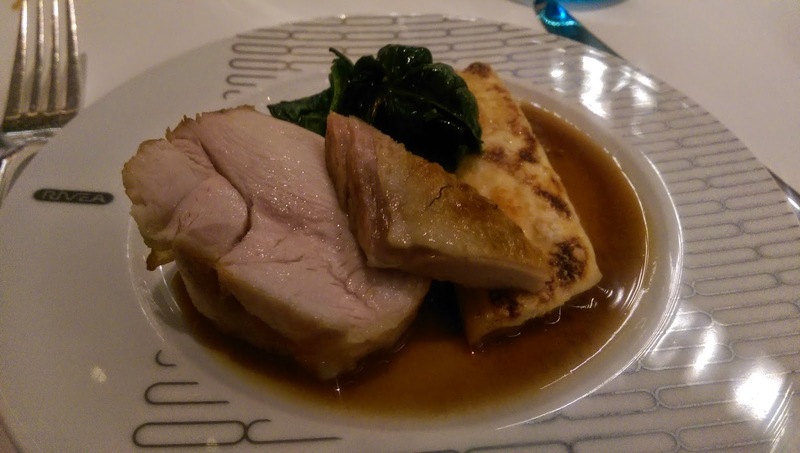 I was especially pleased that Rivea, located in the Bugati Hotel in Knightsbridge was actually pretty damn affordable - the concept is a small plates system but for the variety and quality that you get, this is absolutely not a problem. The restaurant itself is very nicely designed, dark and decorated nicely and tastefully. You do get a definite feel of luxury when you're there. The service is very good - to be fair when we went it was surprisingly quiet so this may be different during busier times but the staff were very attentive and friendly. We went for one of their special offers, which was £35 for four plates (two starters, one Rivea plate, one dessert) plus a glass of wine. 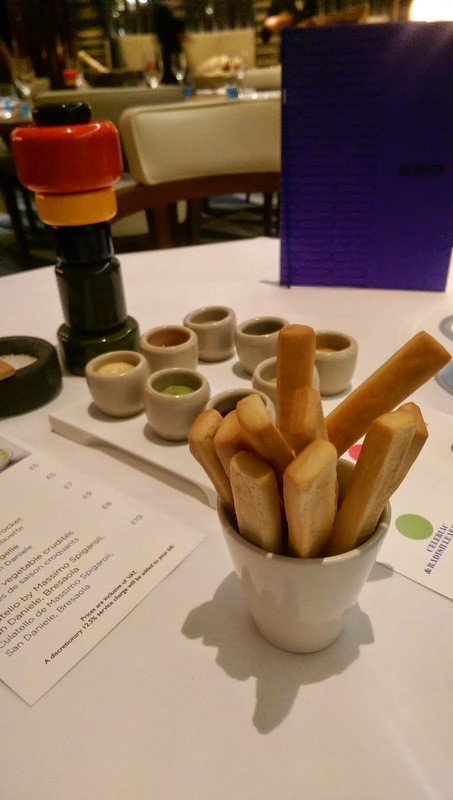 Your meal starts with this intriguing little breadstick platter! You get a little pot of breadsticks, plus a selection of eight little condiments to go with it along with a little card that tells you what is in each one. I was perhaps overly pleased by this but I thought it was such a good idea and got us excited for the rest of the meal. There was a good variety of tastes and so there was definitely something for everyone - I had three favourites whilst he had two, and neither of those overlapped. 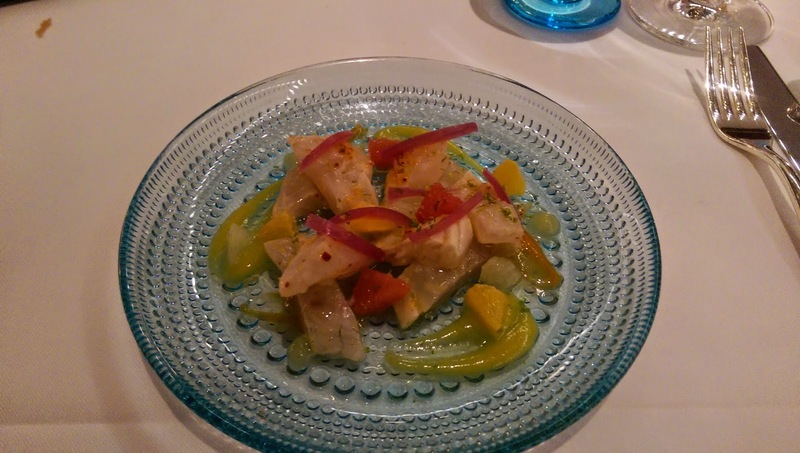 For my first starter, I had the marinated sea bream with citrus and it was delicious. I really took my time on this as I was enjoying it so much, there's a really interesting variety of flavours to it. I didn't take a picture, but my second starter was a chestnut veloute with ricotta ravioli and this was SO GOOD. I think I probably preferred it to the other, it was just amazing. All of the tastes in it were so good and went together so nicely. I would happily eat nothing but this for a week. For my Rivea plate I had chicken breast with macaroni au gratin - before it arrived I joked a bit about it essentially being posh Mac & Cheese, and to an extent part of it sort of was, but it was absolutely delicious. I'm not sure all the flavours went together as well as the previous two dishes, but I still really enjoyed it and would have happily eaten a lot more of it. Pudding is where I was less pleased, but that is partially my fault as I went for the risky choice. I very rarely order tiramisu but I was feeling adventurous, so we both went for it. And unfortunately neither of us liked it all that much - but from my perspective I can say that wasn't necessarily the fault of Rivea as I am really hit and miss when it comes to tiramisu and was just feeling brave - if you're a lover of it perhaps you would have loved this too! I had the white wine that came with the meal and it was great, although I'd say the serving sizes are a little smaller than you'd get in other restaurants. Delicious, though. Overall, I really enjoyed this restaurant, and I'm feeling bad that the full extent of my descriptions are basically coming down to, "IT WAS GREAT," but genuinely, I was enjoying the meal so much that I really didn't take too much time to go into the details! I really loved this restaurant though and will definitely be returning soon. I go to restaurants and enjoy them and plan to go at some point in the future, but this is the first restaurant in a long time where half way through the meal I have known that I plan on going back as soon as possible! You can view Rivea's website, here.